And my lid has been visting for the last few days. 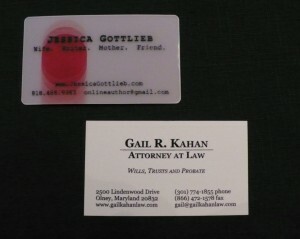 Even our business cards are remarkably different. Mine features a bouncing red ball and won’t stand still long enough for a photograph. Hers is on thick textured paper and exudes East Coast responsibility. I didn’t need Dr. Freud to tell me this means something. Does your lid need a summer intern? OMG, I love your new business cards! In fact, I took Elizabeth’s card after we left your house! It entertained my kids for quite a while during dinner prep!